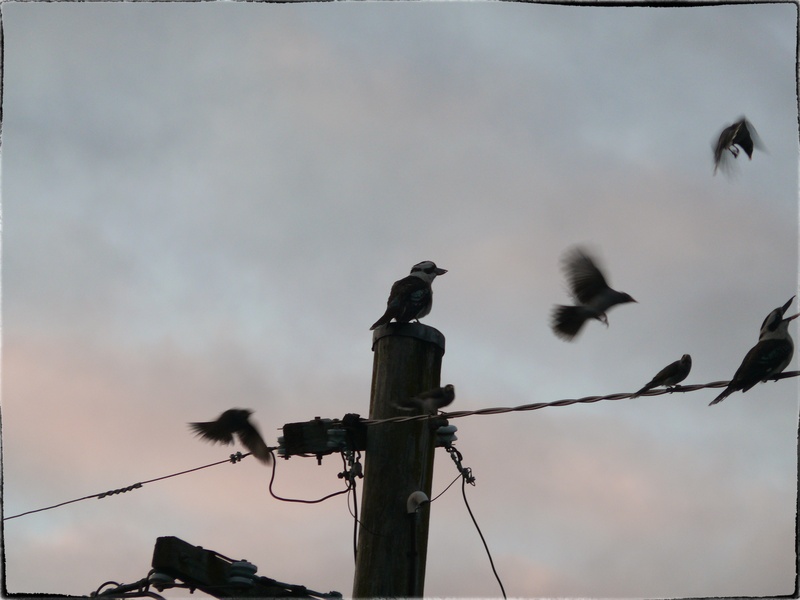 On nights when storms are brewing and the sun sets like a Hermes scarf, I see the kookaburras on the wire laughing at the shadows. Smaller birds harass them, attempting to claim their vantage points, but the kookaburras are unmoved. Their ancestry in this land is old, their spirits are sage, shrewd; another day with food, water and flight aplenty is all they seek. When you see a creature you have only ever heard of in songs or books before, it makes you do a double take. The kookaburra looked at me with his wise black eye. I looked at him, willing myself to be brave and stare straight back. Somehow in that moment we knew each other. Can you feel a kinship with a wild thing? With a bird that knows the sky, the sun and the wind better than you ever could? I think you can, I think when you share that moment of connection you realise that despite differences in wings and feathers, skin and bone, we are all the same. The kookaburras laugh once more as the thinnest stream of light remains. The laugh rises and mingles with the purple dark; a sound that is a bit like joy, a bit like tears. The shadows grow thicker, purpose gathers, and suddenly the wires are clear as wings cut through the indigo air. Velvet, strong as the light of wishes, ending the day. * Kookaburra was written by Marion Sinclair in 1932. You can listen to a kookaburra laughing here. We have a family of kookaburras just up the road in a few trees there, and I hear them every morning without fail, they are beautiful birds, and I grew up listening to them nearly every day, I just couldn’t imagine not having them around. We don’t see the kookies as much as we used to in the inner city areas of Sydney, Mags, but there still are a few small family groups around. I also couldn’t imagine not having them around, for me they are a huge part of the landscape. I’m an old girl too 😉 Old girls rule!!! This is fantastic. I love your descriptions and the mood you set right from the start of the piece. Great post Selma. Thank you writingfeemail. That means so much to me! What a cool laugh….enjoyed you post. It is a cool laugh. It gave me such a fright the first time I heard it, slpmartin. I didn’t know what it was. But now I feel it really fits the Australian landscape. The thing I find most striking about the differences in our locations is not that we are on opposite sides of the planet, or that our seasons run in opposite courses, it’s the birds. Like you as a kid, I’m sure I’d be walking around in wonder. Your birds are so wonderfully exotic. And yes, I believe you can have that kinship. It’s kind of like when dogs know you are smiling at them. Beauty post Selma. The birds are exotic here, Jen, for sure. You should see how they change the further north you go – lots of parrots and wonderful colours. It’s amazing. Oh yes. I get that kinship with dogs too. They do know when you’re smiling at them. I think they smile back! I doubt I’d even be able to identify a kookaburra bird. As usual, lovely piece of writing, Selma. You probably would recognise one, Meleah, because they’re a member of the kingfisher family, just a little bigger. They’re really cute. A lovely poetic post. I love kookaburras. I love them too, Bluebee. They are quintessentially Australian! hi. just me testing this wordpress log in commenting thingy! Test away. I wonder why you can’t comment, Lucent. I’ll fiddle around with things and see if I can fix it for you. Selma, this is such good writing. That first paragraph is just stunning, pure poetry. Actually the last couple are pretty spectacular too. I absolutely think we can feel a kinship with an animal or bird. Sometimes they look you right in the eye — the eye… think about that; why not the mouth where sounds come from, why the eye? — for longer than is necessary, and you somehow exchange thoughts like a conversation. So glad I could fill in the picture for you, Josie. That is awesome. I think that song was taught to kids all over the world! The lawsuit was so upsetting, Gabe. My hubby and I know the guy who started the lawsuit (the record industry is very small) and he is one of the world’s biggest #@$*s. I don’t care if he reads this. What he did was deplorable. He did it to prove a point, not because he needed the money. It devastated Greg Ham. So sad. I heard that sing as a child and never knew what they sounded like. Now I know! Great post Selma, I learn something new almost every time I visit! I love that aspect of blogging, Cathy. Learning about other places and people. It’s very cool! Kookaburra, Kookaburra – sounds like a child named the bird. A fun sounding name. They laugh? Kookaburras must be the hyenas of the birds! Actually they do sound a bit like hyenas, Roshan. You’re right!! !